I just love how this turned out. 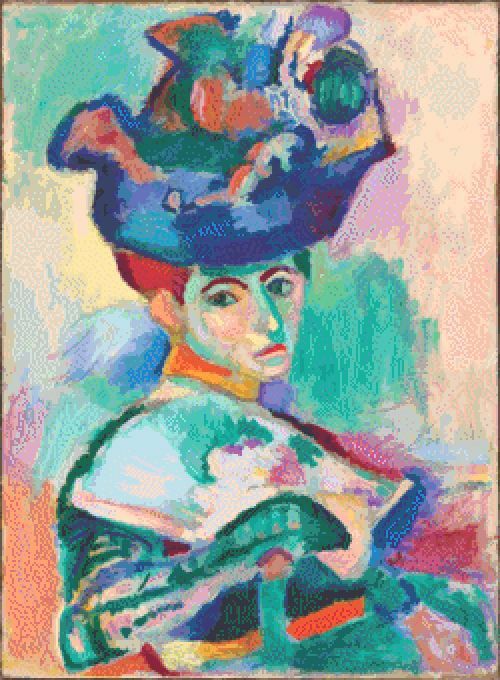 This is Woman in a Hat originally painted by Henri Matisse in 1905. The painting is on display at the San Francisco Museum of Modern Art. The copyright it expired, so the original image is free to use as public domain. That said.. I edited it quite a bit to make it more clear and vivid, so you won’t find this to be exactly like the original. It will be fun and turn out like this mock-up. This chart is 250 x 340 stitches. it will be 13.89 x 18.89 inches in size when completed on 18 count fabric. It can be done on any size though. It contains 163 colors.